Discuss the wave character of light. Identify the changes when light enters a medium. where is the speed of light in vacuum, is the frequency of the electromagnetic waves, and is its wavelength. The range of visible wavelengths is approximately 380 to 760 nm. As is true for all waves, light travels in straight lines and acts like a ray when it interacts with objects several times as large as its wavelength. However, when it interacts with smaller objects, it displays its wave characteristics prominently. Interference is the hallmark of a wave, and in Figure 1 both the ray and wave characteristics of light can be seen. 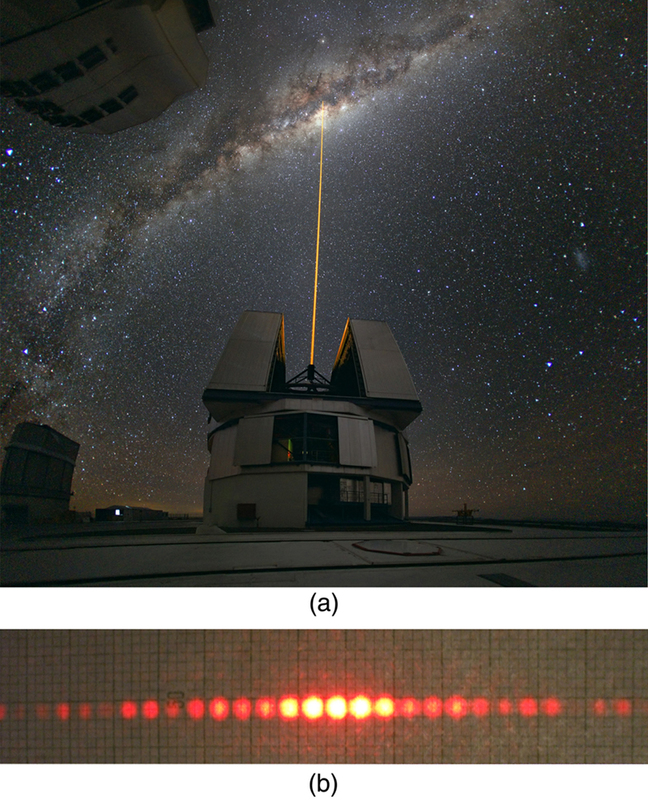 The laser beam emitted by the observatory epitomizes a ray, traveling in a straight line. However, passing a pure-wavelength beam through vertical slits with a size close to the wavelength of the beam reveals the wave character of light, as the beam spreads out horizontally into a pattern of bright and dark regions caused by systematic constructive and destructive interference. Rather than spreading out, a ray would continue traveling straight ahead after passing through slits. The most certain indication of a wave is interference. This wave characteristic is most prominent when the wave interacts with an object that is not large compared with the wavelength. Interference is observed for water waves, sound waves, light waves, and (as we will see in Chapter 28 Special Relativity) for matter waves, such as electrons scattered from a crystal. where is the wavelength in vacuum and is the medium’s index of refraction. Therefore, the wavelength of light is smaller in any medium than it is in vacuum. In water, for example, which has , the range of visible wavelengths is to , or to . Although wavelengths change while traveling from one medium to another, colors do not, since colors are associated with frequency. Wave optics is the branch of optics that must be used when light interacts with small objects or whenever the wave characteristics of light are considered. Wave characteristics are those associated with interference and diffraction. Visible light is the type of electromagnetic wave to which our eyes respond and has a wavelength in the range of 380 to 760 nm. Like all EM waves, the following relationship is valid in vacuum: , where is the speed of light, is the frequency of the electromagnetic wave, and is its wavelength in vacuum. The wavelength of light in a medium with index of refraction is . Its frequency is the same as in vacuum. 1: What type of experimental evidence indicates that light is a wave? 2: Give an example of a wave characteristic of light that is easily observed outside the laboratory. 1: Show that when light passes from air to water, its wavelength decreases to 0.750 times its original value. 2: Find the range of visible wavelengths of light in crown glass. 3: What is the index of refraction of a material for which the wavelength of light is 0.671 times its value in a vacuum? Identify the likely substance. 4: Analysis of an interference effect in a clear solid shows that the wavelength of light in the solid is 329 nm. Knowing this light comes from a He-Ne laser and has a wavelength of 633 nm in air, is the substance zircon or diamond? 5: What is the ratio of thicknesses of crown glass and water that would contain the same number of wavelengths of light? 27.1 The Wave Aspect of Light: Interference by OpenStax is licensed under a Creative Commons Attribution 4.0 International License, except where otherwise noted.